A SEAL climbs aboard a SDV before launching from the back of the submarine USS Philadelphia. A frogman is someone who is trained in scuba diving or swimming underwater in a tactical capacity that includes combat. Such personnel are also known by the more formal names of combat diver, combatant diver, or combat swimmer. The word frogman arose from Italian "uomo rana" around 1940 from the appearance of a diver in a shiny drysuit and large fins. Combat swimming is often used to mean combat diving. [clarification needed] Such actions are a historical form of "frogman" activity and an important feature of naval special operations. In the U.S. military and intelligence community, divers trained in scuba or CCUBA who deploy for tactical assault missions are called "combat divers". This term is used to refer to the Navy SEALs, operatives of the CIA's Special Activities Division, elements of Marine Recon, Army Ranger Regimental Reconnaissance Company members, Army Special Forces divers, Air Force Pararescue, Air Force Combat Controllers, U.S. Coast Guard Helicopter Rescue Swimmers, United States Naval Search and Rescue Swimmers, United States Air Force Special Operations Weather Technicians, and the Navy Explosive Ordnance Disposal (EOD) units. In Britain, police divers have often been called "police frogmen". The Encyclopaedia Britannica provides a narrower definition for Frogman, Naval personnel (which suggests the possibility of other meanings) as an unarmed member of a US Navy underwater demolition team which reconnoitred beach landing areas, observed enemy positions near the shore, and detected and cleared dangerous underwater obstructions. It is intended that the enemy does not find out then or afterwards that the action has happened. Installing eavesdropping devices is the best example. Approach, installing the devices, and departure are all to be kept from the knowledge of the enemy. If the operation or its purpose is exposed, then the actor will usually make sure that the action at least remains "covert", or unattributable: e.g., "... the secretary will disavow any knowledge of your actions". The word frogman appeared first in the stage name The Fearless Frogman of Paul Boyton, who since the 1870s broke records in long distance swimming to demonstrate a new invented rubber immersion suit, which inflated hood had a frog-like shape. As a stunt show hero in that suit he played a military diver (attaching mines to ships etc.) long before such divers existed. After Italy declared war, the Decima Flottiglia MAS (Xª MAS) attempted several attacks on British naval bases in the Mediterranean between June 1940 and July 1941, but none was successful, because of equipment failure or early detection by British forces. On September 10, 1941, eight Xª MAS frogmen were inserted by submarine close to the British harbour at Gibraltar, where using human torpedoes to penetrate the defences, sank three merchant ships with limpet mines before escaping through neutral Spain. An even more successful attack, the Raid on Alexandria, was mounted on 19 December on the harbour at Alexandria, again using human torpedoes. The raid resulted in disabling the battleships HMS Queen Elizabeth and HMS Valiant together with a destroyer and an oil tanker, but all six frogmen were captured. The 1951 movie The Frogmen used three-cylinder aqualungs, as shown on the DVD cover. At the time DESCO were making three-cylinder constant flow breathing sets that lacked the demand valve of the aqualung, but they were rarely deployed in the war, and the preferred system in the US armed forces was the rebreather developed by Dr. Christian J. Lambertsen. The 1958 film The Silent Enemy with Laurence Harvey as Lionel "Buster" Crabb, describes his exploits during World War II. It was made following the publicity created by Crabb's mysterious disappearance and likely death during a Cold War incident a year earlier. The 1955 film Above Us the Waves, based on the 1953 book of the same title, includes a reenactment of Operation Title, the attempted attack by British frogmen on the Tirpitz in 1942. The film is notable for the efforts made to be historically accurate. The 1965 James Bond film Thunderball depicts an extended underwater battle, featuring frogmen. In the 1966 sci-fi film Fantastic Voyage and its accompanying novelization by Issac Asimov, the character of former navy veteran and now government agent Charles Grant is referenced as a communications expert and experienced frogman. The film Submarine X-1, made in 1969, loosely based on the real Operation Source, gets British World War II frogman's equipment very wrong and anachronistic. The breathing sets shown were open-circuit and were merely a very fat cylinder across the belly, with a black single-hose second-stage regulator such as was not invented until the 1960s. Also shown were ordinary recreational scuba weight belts and diving half masks with elliptical windows. The frogmen in the real war operation mostly used Sladen suits and an early model of Siebe Gorman rebreather with a backpack weight pouch containing lead balls releasable by pulling a release cord. The 1972 movie Tintin and the Lake of Sharks featured some frogmen among Mr Rastapopolus's conspiracy. Some scuba diving clubs have an entry class called "Tadpoles" for younger children who want to start scuba diving. Wrong use of the word "frogman"
A new English translation of the book Twenty Thousand Leagues Under the Sea uses the word "frogman" uniformly and wrongly to mean a diver in standard diving dress or similar, to translate scaphandrier. Some authors[who?] seeing ancient Assyrian stone carvings of men crossing a river, each using a goatskin float (with a tube to inflate it by mouth), wrote wrongly that the float was a crude underwater breathing set. 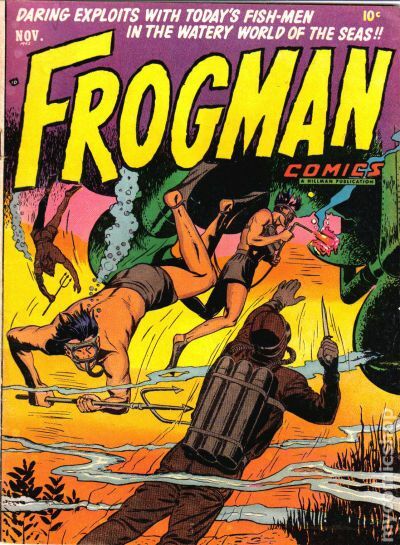 Many comics have depicted combat frogmen and other covert divers using two-cylinder twin-hose open-circuit aqualungs. All real covert frogmen use rebreathers because the stream of bubbles from an open-circuit set would give away the diver's position. Many aqualungs have been anachronistically depicted in comics in stories set during World War II, when in reality at that time period aqualungs were unknown outside Jacques-Yves Cousteau and his close associates in Toulon in south France. Some aqualungs were smuggled out of occupied France during the war (these may have been Commeinhes regulators), but the aqualung for the most part was not a player in combat in World War II. The movie The Frogmen also made this mistake, using three-cylindered aqualungs, including on its movie poster. DESCO were making three-cylinder constant flow sets that lacked the demand valve of the aqualung, but they were rarely used in the war, and the preferred system was the rebreather developed by Dr. Christian J. Lambertsen. Ian Edward Fraser V.C. in 1957 wrote a book Frogman V.C. about his experiences. Whoever designed its dust cover depicted on it a frogman placing a limpet mine on a ship, wearing a breathing set with twin over-the-shoulder wide breathing tubes emitting bubbles from behind his neck, presumably drawn after an old-type aqua-lung. There have been thousands of drawings[original research?] (mostly in comics, some elsewhere) of combat frogmen and other scuba divers with two-cylinder twin-hose aqualungs shown wrongly with one wide breathing tube coming straight out of each cylinder top with no regulator, far more than of twin-hose aqualungs drawn correctly with a regulator, or of combat frogmen with rebreathers. Lionel Crabb, a frogman who spied on a Soviet warship in Portsmouth, UK. ↑ Thukydides, History of the Peloponnesian War, edition Ambrosio Firmin Didot, Paris, 1842, book 4, 26, and b. 7, 25. In Greek and Latin. ↑ Pierros D. Nick, The tactics of the enemies in the sea warfare during the Peloponnesian War. 1st Pan-Corinthian Congress, Corinth, Greece, 2008. In Greek. N. Pierros is a Civil Engineer and author of historical essays. ↑ http://d1466nnw0ex81e.cloudfront.net/n_iv/600/809545.jpg This image of a comic page has an example of this error.